Pteropyllum common name Angel fish. They can grow nearly 25 cm / 10 inches fully grown. They are best kept in water parameters of Ph range 6.5-7.5, and temperatures of 24-27 Celsius / 74-80 °F. 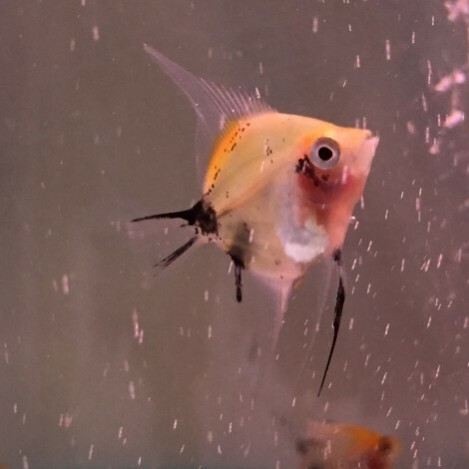 Angel fish are the most well known tropical fish (we use them for our shop logo). They certainly add a lot of grace and beauty to an aquarium. With such a wide range of colours, and fin lengths, and shapes, they are a majestic fish to have in a tropical tank. They belong to the Cichlidae family, so they do have an aggressive side. Mixing them with small fish can be risky as when they grow they can get aggressive. They will mix in small groups or on there own. 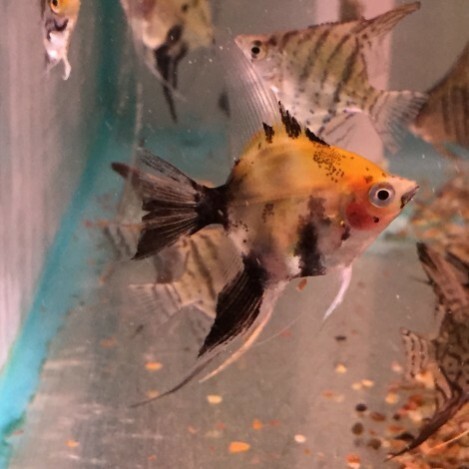 We would recomend if you are mixing them together in small group, to try and get them all the same sort of size, as the bigger the angel fish the more aggressive they can be towards the smaller size angel fish. 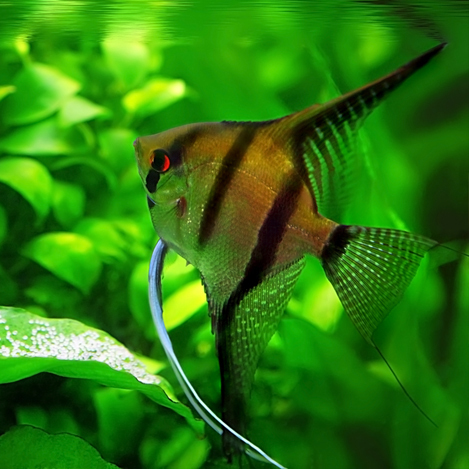 Angel fish can be greedy fish, however they only have smallish mouths so smaller size food is best. Flake, pellets, granular foods are good for them. But they do require meat in there diet so frozen, or live food is good to feed them. Flake, pellets, and granular foods. They do require live and frozen foods in there diet to keep them healthy and happy. With there aggressive behaviour feeding once to twice a day can keep them from snatching at other fish in the tank. But make sure you do not over feed as this can turn off your tank.